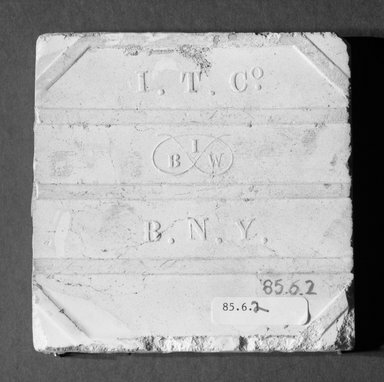 Glazed earthenware square tile embossed with snowflake in circle, the entire bordered with a square, smaller squares in each corner contain a quatrefoil; light yellow glaze. CONDITION: Traces of old mortar on edges and back. Chips on edges and corners of back and one corner of front; some glaze chips on front edges and red discoloration at places, front edges.